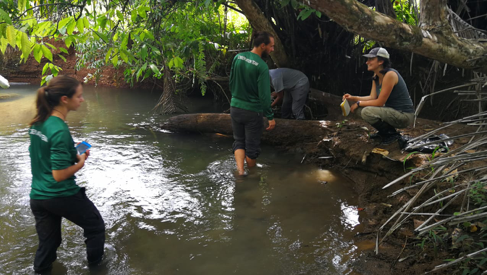 One sunny day this summer, the Ríos Saludables team was wading through the rivers Agujas, La Palma, Montarey, and Sabalo, collecting shrimp traps number 122 through number 132. 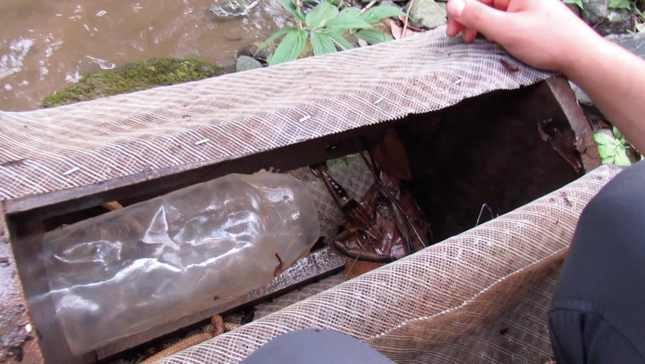 It was the third time in three months that we had set and collected traps all along these rivers, and we were back the second time that week to check on the traps that we had set the day before. In other words, sometimes even the best field work gets repetitive. The Ríos Saludables team in Río Agujas, from left to right: Hilary Brumberg, Keje Nagel, and Avery Kaplan. 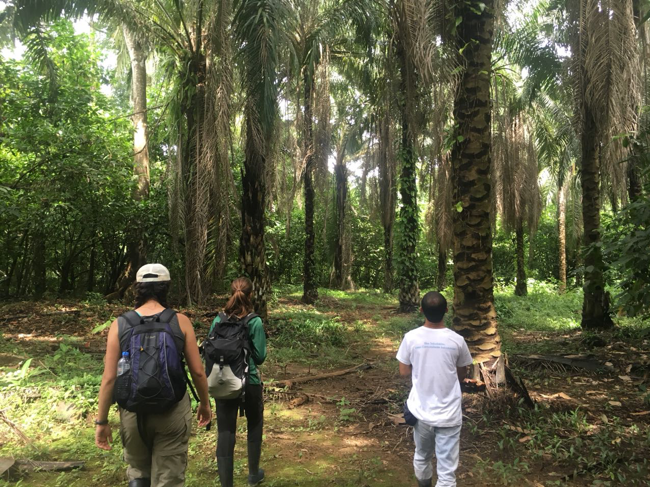 Out of the ordinary though, we started off the day at a sustainable farm in La Palma to pick up Alex, the coordinator of the Osa palm farmers’ cooperative and one of Ríos Saludables’ local river monitoring partners, and Brian, the Peace Corps volunteer working with him. Alex has participated in many Ríos Saludables expeditions before, and was excited to see the new multiparameter probe we were using to take water quality measurements. 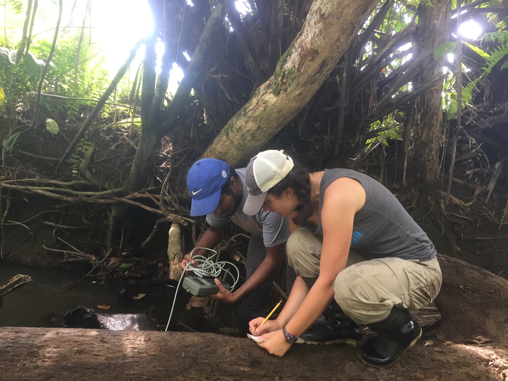 Avery, an Osa Conservation intern, and Brian, a Peace Corps volunteer, using the multiparameter probe to get conductivity, salinity, dissolved oxygen, and temperature measurements at a trapping site. As we walked through the straight rows of palm plantation down to the first collection site in Río Agujas, we explained to the new volunteer why we were trapping shrimp: Osa Conservation is conducting the first ever study of giant freshwater shrimp in the Osa Peninsula to understand whether diversity is affected by the type of land-use adjacent to the river. Shrimp are a good indicator species because they migrate throughout rivers, making their abundance a reliable measure of river health. Walking to a river that cuts through palm plantation. Plantation is one of four land use types we are studying. The others are grassland, old growth forest, and secondary forest. After arriving at the first site and taking water quality and canopy measurements, we pulled the shrimp trap from the river to see what we would find. As we took shrimp out of the trap, being careful to avoid their pinchers, seeing the shock on Brian’s face at the size and variety of shrimp reminded me just how extraordinary these creatures are. They range from less than a gram to more than 70 grams, can be bright blue or perfectly camouflaged, and—due to anthropogenic impacts (such as deforestation and river poisoning)—are becoming a rare sight to see. A Macrobrachium americanum, patiently waiting to be identified. Similar to the design of a minnow trap, this homemade shrimp trap is made from upcycled wood, bottles found on the beach, and mesh. 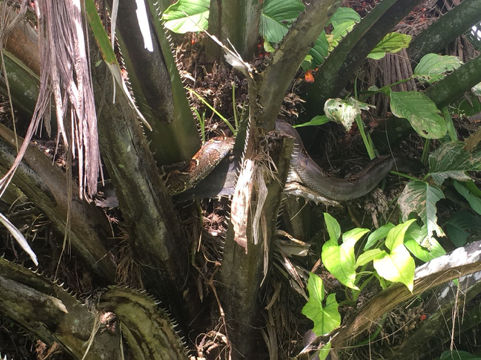 On the walk to the next trapping site, Alex spotted a boa in a palm tree. A little later, he disappeared into the brush and returned with a cacao fruit for us to snack on. Between Alex’s keen experienced eyes, and Brian’s fresh ones, I saw more that day in the field than I ever would have expected. Every day in the Osa is an adventure, with much to learn. The boa hidden in a palm tree. Can you spot it?